This is a sponsored post for UnitedHealthcare Accidents happen. Emergencies occur. You get sick. These are all things that come into our lives at one point or another, or for some, these happen more frequently than you want. Wouldn't you like a system that helps you get through these quickly and efficiently? With UnitedHealthcare they have options that allow you to call a nurse 24 hours a day/7 days a week, or do a virtual visit with a health care professional like your doctor online. Emergency Rooms can be expensive. With choices like Quick Care Centers and Urgent Care you can get the care you need without all the emergency room prices. You can check out this link here to get more information on all the choices that UnitedHealthcare can offer you. 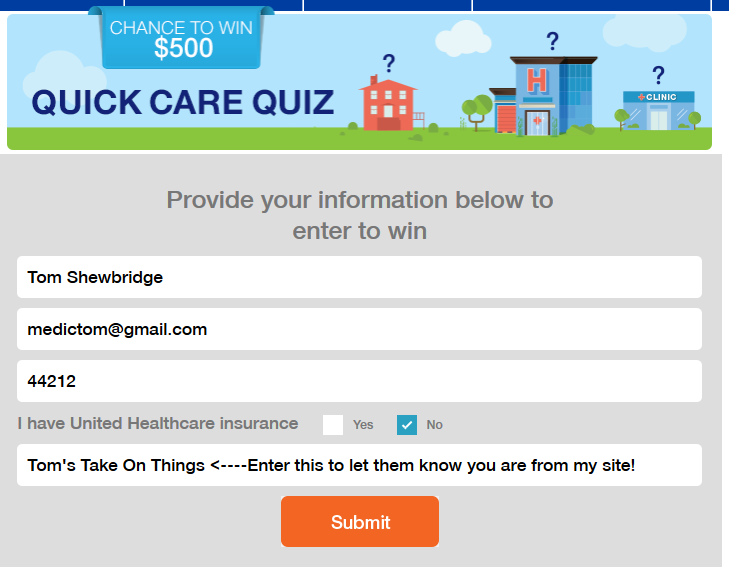 The Quick Care Quiz teaches you everything I mentioned above. It teaches you the differences between all the options and their costs. Going to the Emergency Room for a sprained wrist would be more economical at a Quick Care or Urgent Care right? So find out how different options can benefit you not only in saving money, but saving time as well. The Quiz will show you the different costs for each service like the 24 Hour Nurse line being free to an Emergency Room visit costing as much as $1200. Being part of UnitedHealthcare offers you options other plans do not. Tom from Tom's Take On Things completed the Quick Care Quiz that you have to finish in order to have a chance to win the $100 Target Gift Card and you can see a screen shot of that below. So here is the awesome thing about all of this. By completing the quiz. 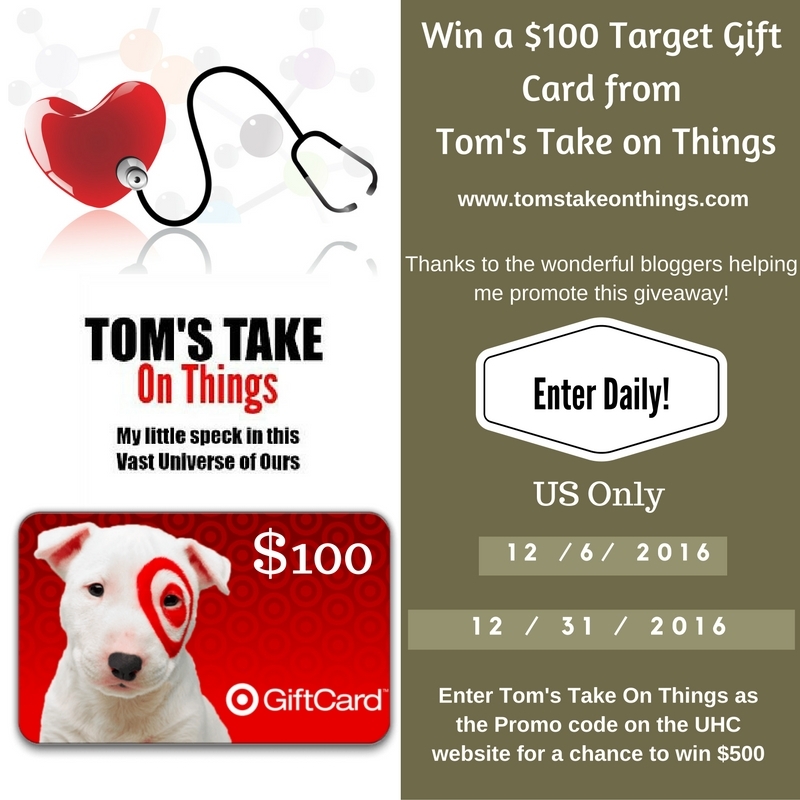 Not only are you entered to win a $100 Target Gift Card from Tom's Take On Things, you are entered to win up to $500 from UnitedHealthcare themselves. How sweet is that? Ready to enter? Just enter following the links in the giveaway widget below. Complete the entire quiz, and enter Tom's Take On Things in the promo code box. There are wonderful bloggers like me helping promote this giveaway, be sure to like our entries in the widget below as well! Giveaway is open to residents of the U.S. only, 18 years of age or older. 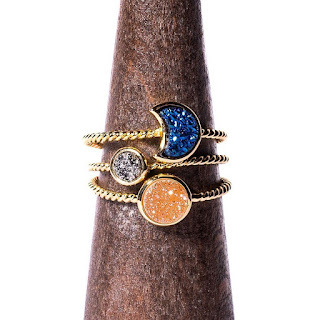 Giveaway ends 12/31 at 11:59pm EST. Participating Bloggers were not paid for this post. Winner will have 24 hours to respond to winning email. You can enter daily. You can tweet daily. You can take the quiz daily for entries into my giveaway as well as theirs! Increase your odds to win! Good Luck from Tom's Take On Things and all the wonderful blogs like mine that are helping promote this giveaway.